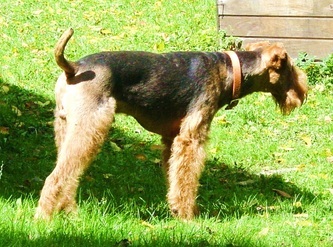 Airedales are amazingly versatile animals. 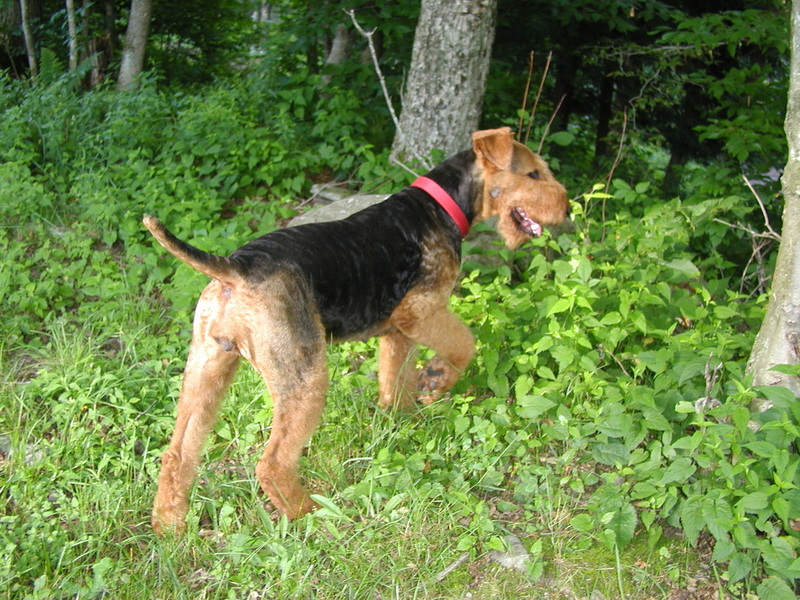 They are the only hunting breed known to have the ability to Point, Flush and Retrieve. They only bark when there is something they need to alert their owners to. 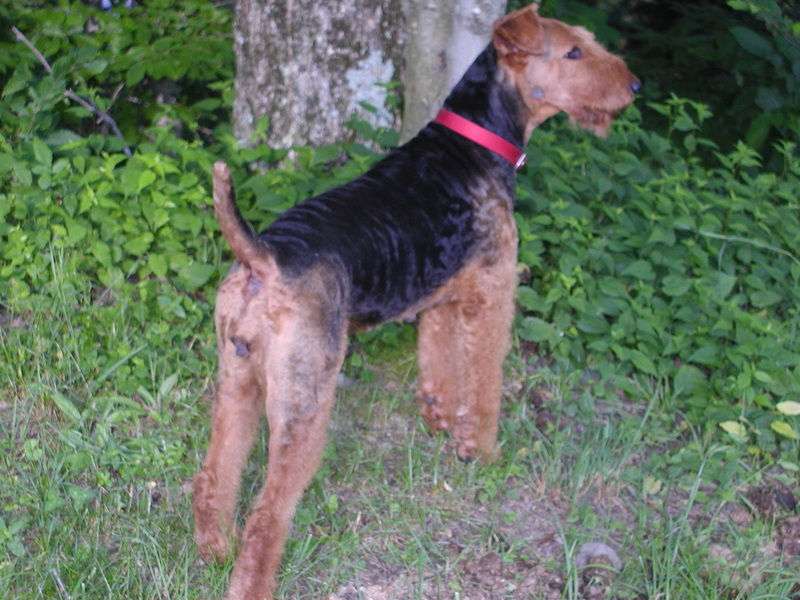 They have a keen eye and sense of smell, and often hear approaching danger or strangers long before people do. 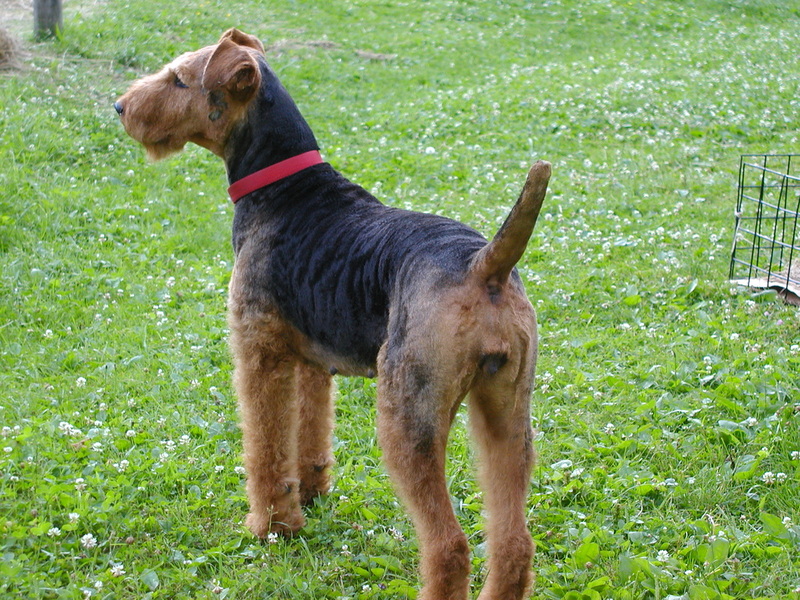 In the western US Airedales are used to keep the hounds alive on the bear hunts. 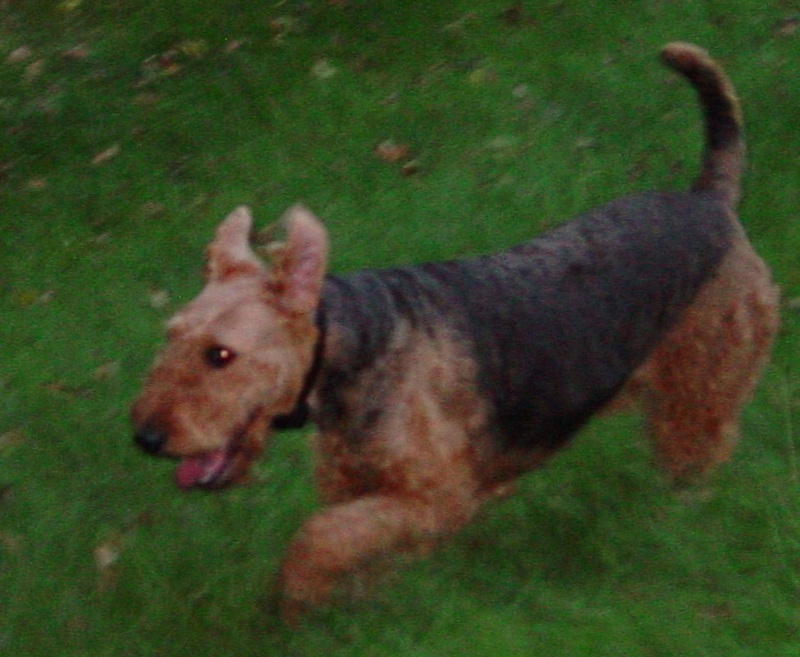 Airedales have a cat like cunning - the hounds find the bear, then the Airedale is released to play 'cat and mouse' with it so the bear doesn't have the opportunity to kill the hounds. 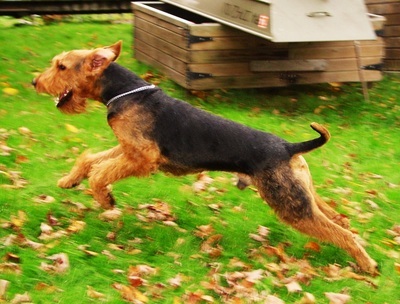 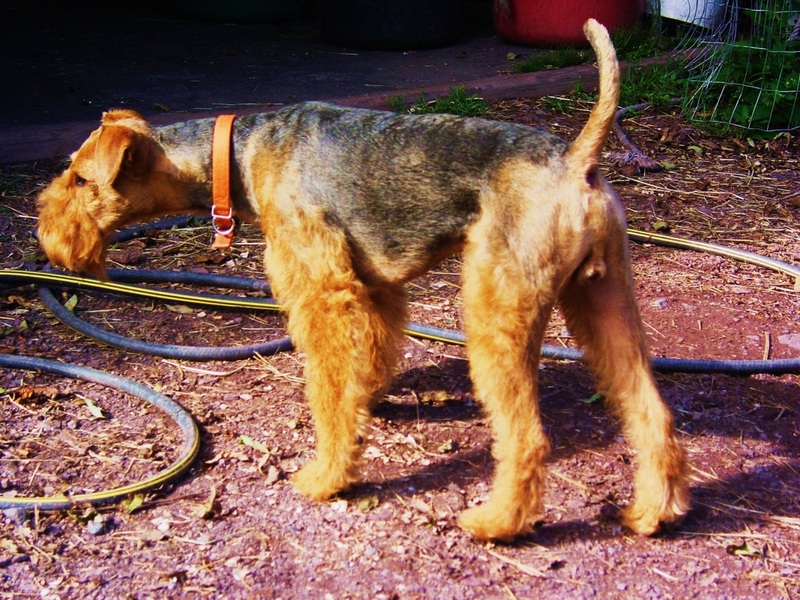 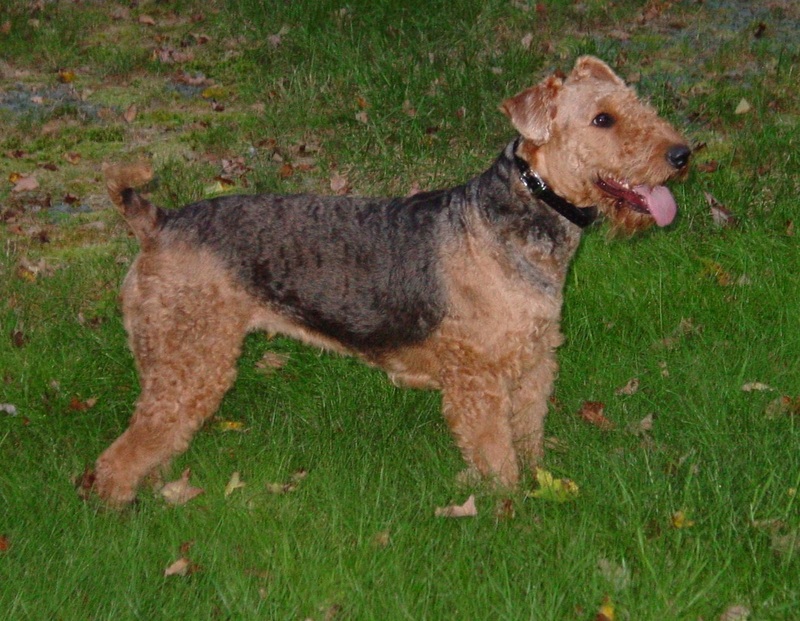 Airedales are athletic and playful, even on in their years. 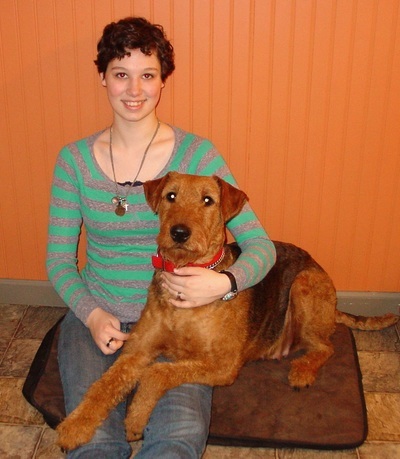 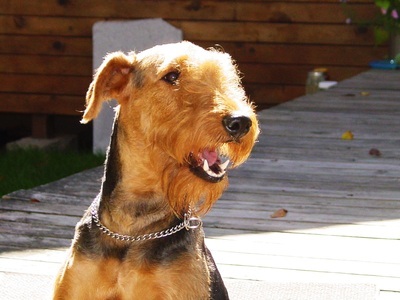 Airedales are extremely loyal to, and protective of their owners and property. 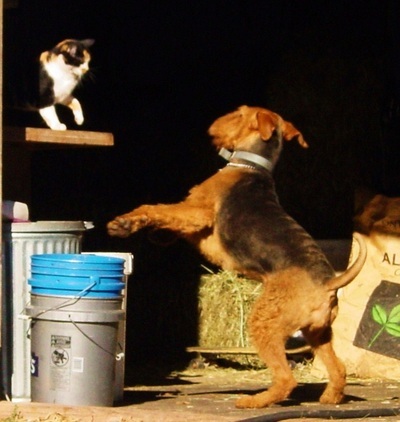 These are territorial dogs. They are always scanning the horizon, testing the air, checking the perimeter... always on duty. 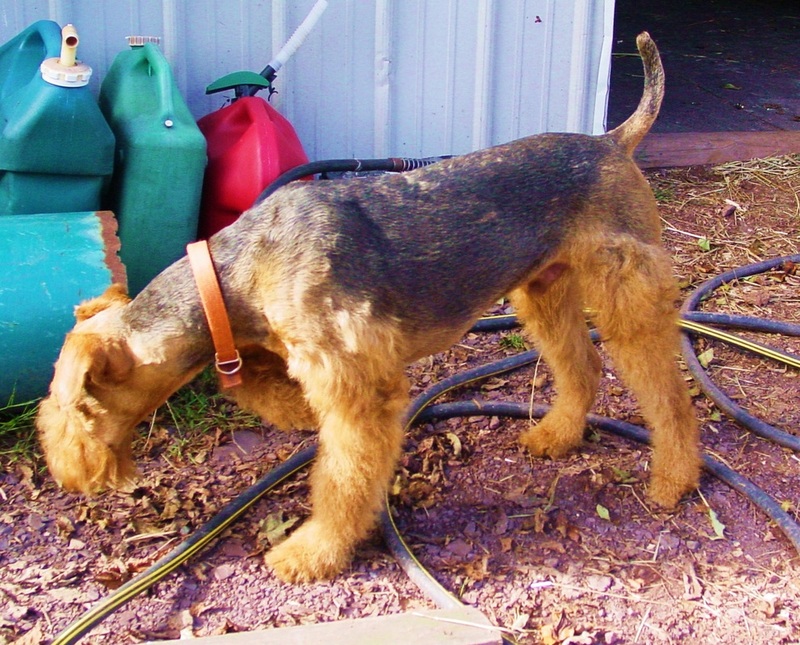 We have used our Airedales to catch rats in the barn, a snake in the rock pile, run off bear in the horse pasture, raccoon from the hen house and chase deer out of the garden! We have been alerted to a bat trapped in the attic eave, and a flying squirrel trapped in the basement. I have seen my Airedale get stung in the mouth over and over, biting (killing) a hornet that was stalking my 3 year old. 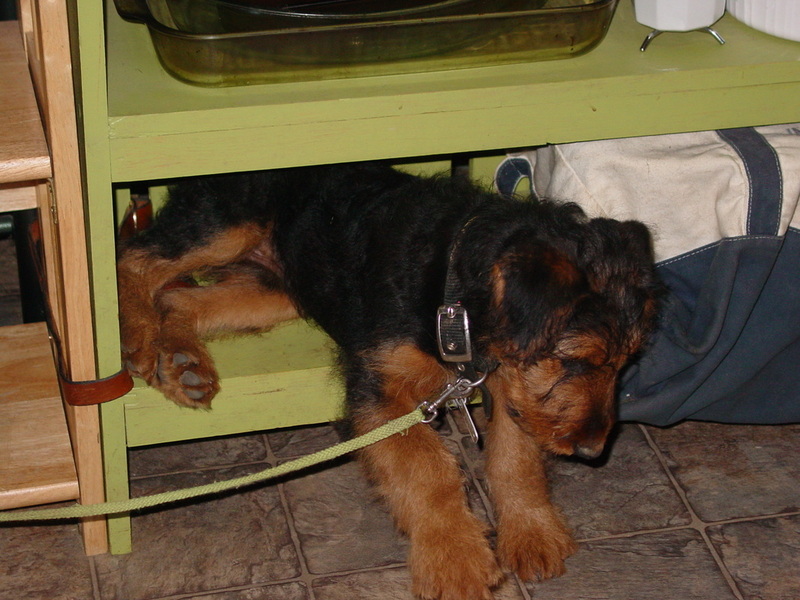 These dogs don't miss anything. Airedales are not high strung. 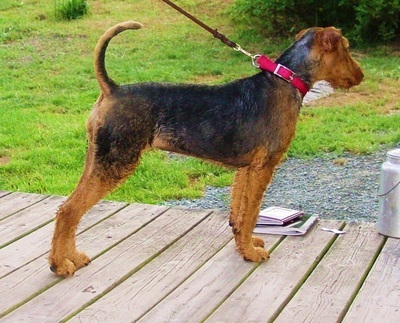 originated by crossing a hound breed with a terrier breed. 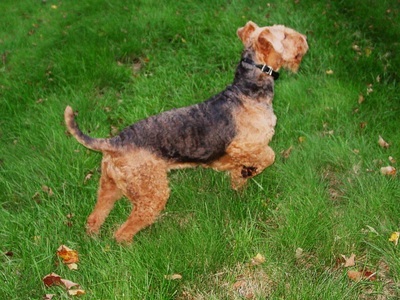 Therefore, they can be high energy and playful... but they have an "OFF Button"! 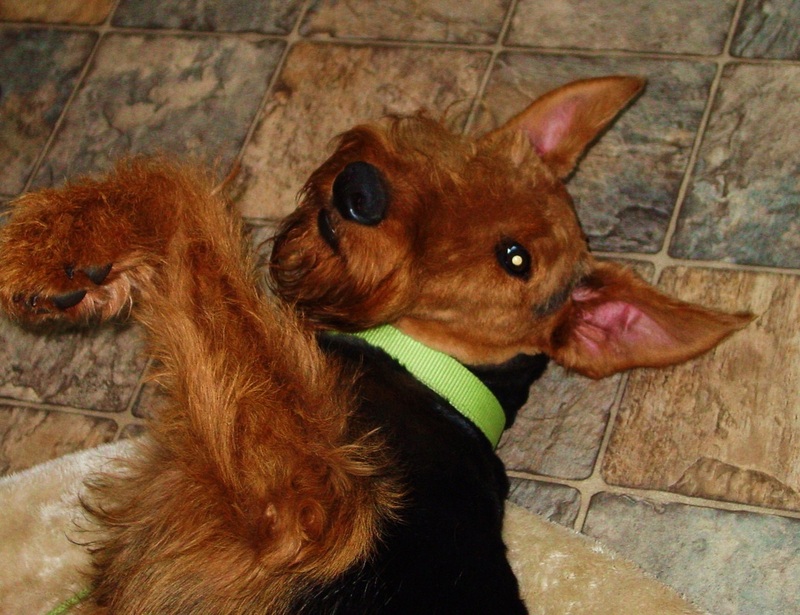 ...."You want to stop playing? Ok, let's take a nap!" 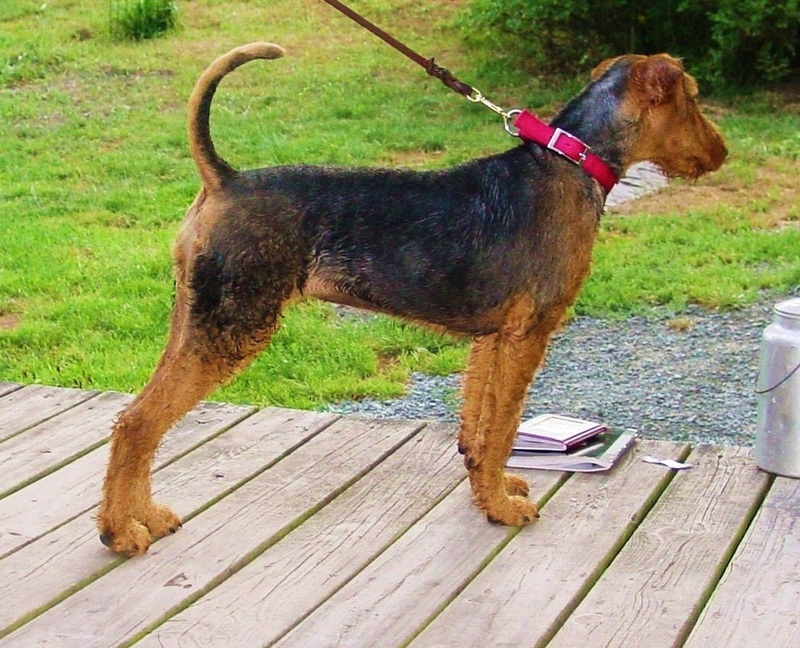 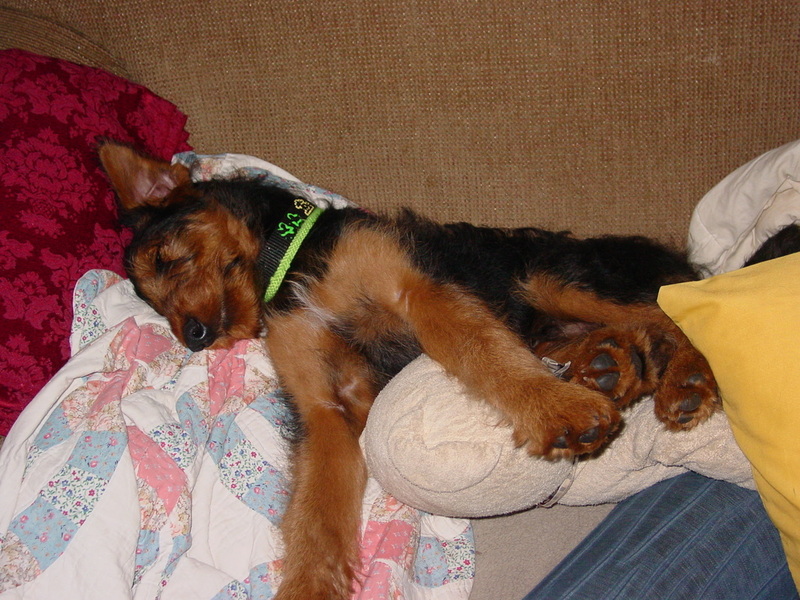 We can help you select the Airedale puppy which may best fit your lifestyle and your purpose(s) for owning a dog. The Airedale is a loving, tender and thoughtful companion for your home. 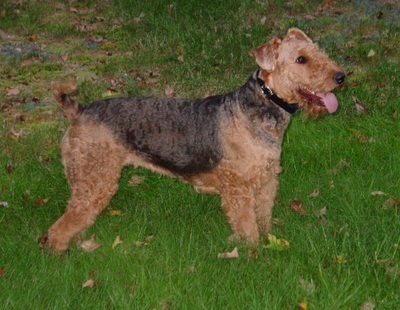 Airedales are among the most easily trained animals in the canine world because they are intelligent and devoted. They are not 'attack' dogs - these are not dogs who will leap out and bite an intruder by instinct. They are designed to be the "Early Warning Signal." 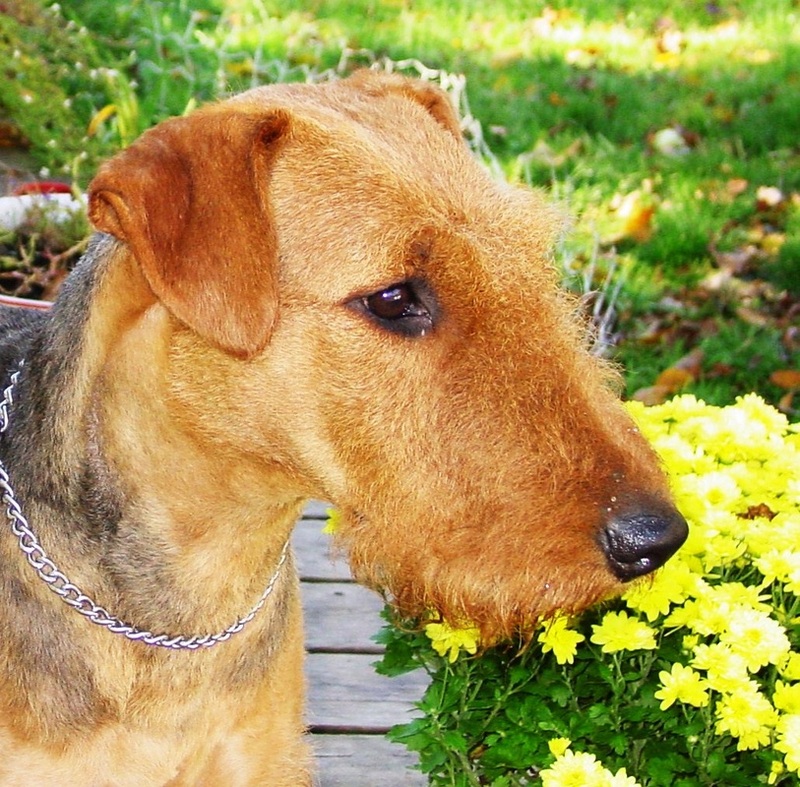 are also tender and sensitive to affection, not cold and unfeeling as some purely 'protection' breeds can be. They THRIVE on love, discipline and praise. 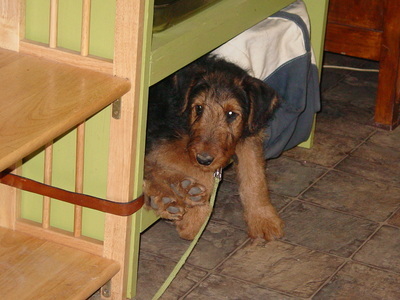 As a matter of fact, without enough human contact, they can get downright cranky or depressed! 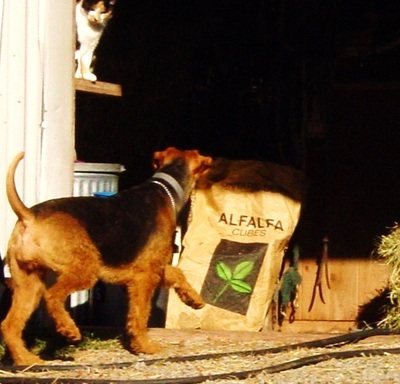 They are the ALL AROUND devoted companion for your children, your family's protection and your hunting trips. they have hair (not fur) so they are non-shedding!